Now, writing this, I recall why we went to Vertis North and Tendon Kohaku. 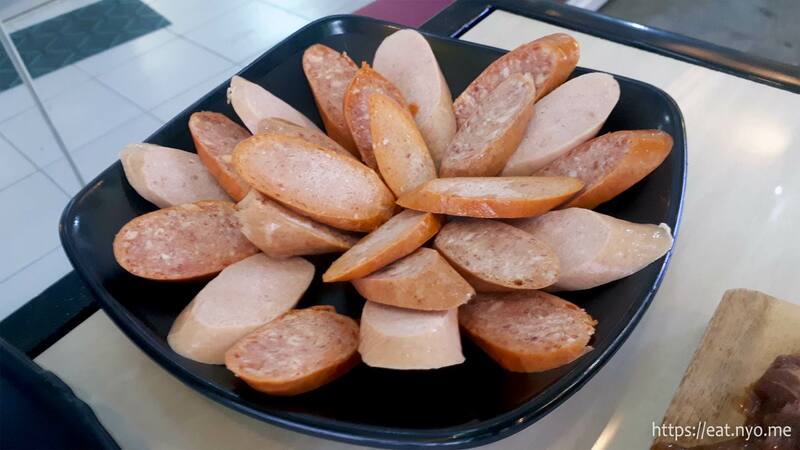 I was actually craving for sausage, specifically Japanese wiener which has a fantastic bite, similar to the Cheese Curry Weiner from 7-Eleven in Japan that I had before. While we’ve been eating various sausages, they just didn’t have the same bite. Among the “much more” that The Cooking Room offers is a variety of sausages, which I hoped will sate this craving. This was actually the second time we went inside the doors of this place. The first time, we were denied a seat because it was almost five in the afternoon and the place was supposedly expecting a “huge crowd”. This time, since we went past five, and since the owner (it seems) was present, we were seated and served. Honestly, had I not been craving for sausages, we would probably never have gone back here and damned this place due to the past experience. 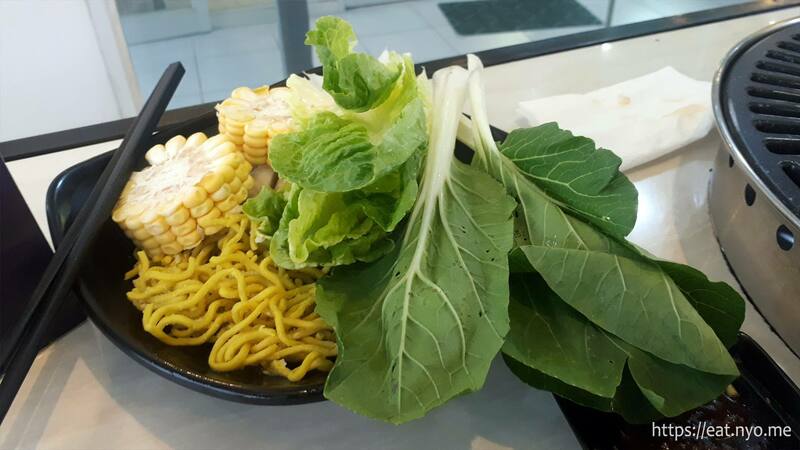 What separates The Cooking Room from other all-you-can-eat places, aside from the sausages, is that they also offer hot pot and Mongolian on top of their all-you-can-eat grill. While the hotpot and grill aren’t exactly unique offerings, the sausages and Mongolian bowl options definitely are. You can mix-and-match these offerings for your desired all-you-can-cook-and-eat-on-top-of-your-table. Their prices are a bit confusing, but we had their sausages and hotpot and grill; the price for that is 499 Php per head. Since The Cooking Room wasn’t very big (there’s only a few tables and a relatively small eating area), the various hotpot items are to be retrieved from a vertical refrigerator. 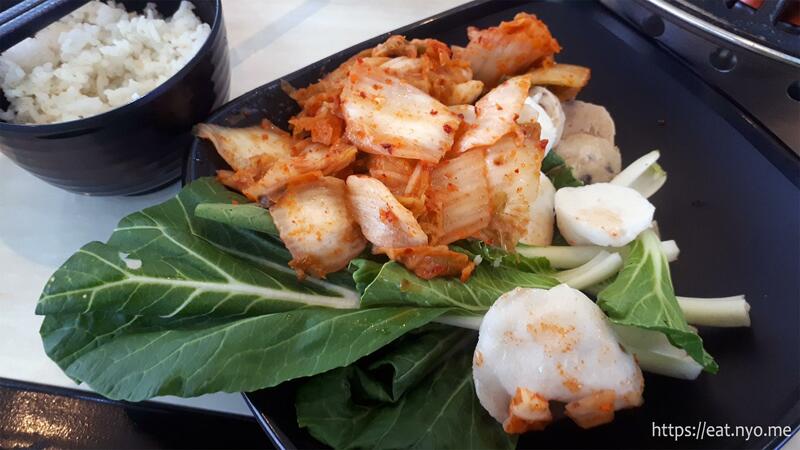 These include various veggies such as kimchi, cabbage leaves, pechay, and corn; various balls such as fish balls and chicken balls; and various noodles. You may also ask for a bowl of cooked rice, which my Betrothed did. I opted out so that I can eat more protein and veggies. We were given a plate full of their sausages as part of our order. I’m not exactly a sausage expert, so I can’t tell what is what and since I enjoy a bit of mystery, I didn’t bother asking. They were cut similarly and were quite cold, so they took a while to cook. I can tell there are at least four varieties here, two of them were quite spicy and the other two quite mild. These were quite reminiscent of sausages we had in Cow Wow. While they were indeed quite flavorful, they sadly didn’t have the nice bite that I was looking for. We were also given two chopping boards full of their meat samples. Similar to the sausages, I can’t exactly say which is which. But I do know there’s three kinds of meat here: beef, pork, and chicken. There’s also at least two varieties of each. Most of them were marinated sweetly. There were a couple of spicy cuts, but not spicy enough to be untolerable for me. 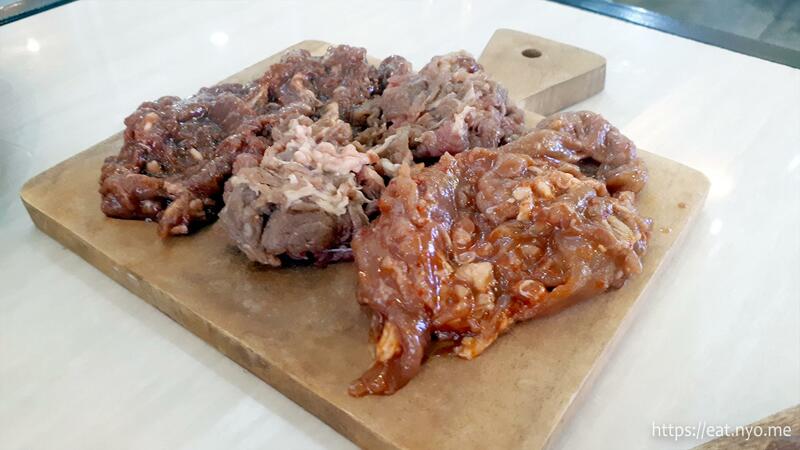 These meats can be enhanced further with sauces you can get on one of the communal counters. 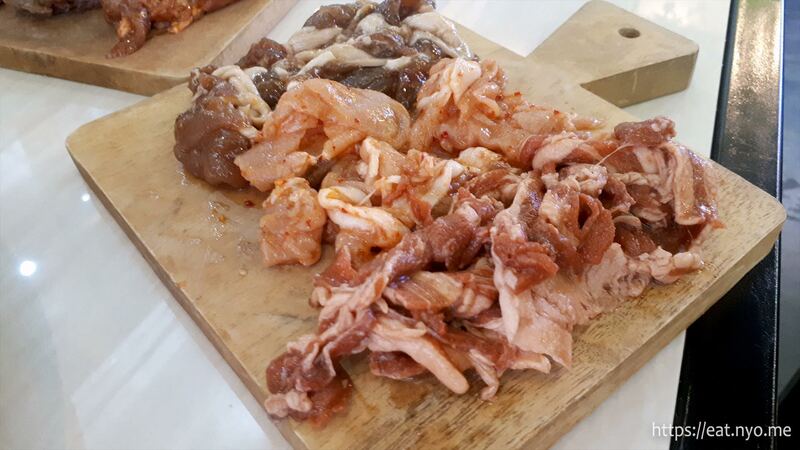 Also, compared to their competition, most of the meat were quite thick and takes a bit longer to cook. Some pros and cons, I guess. Honestly, we could’ve forgone the grill and sausages, paid much less, and just enjoyed their kimchi and hotpot offerings. 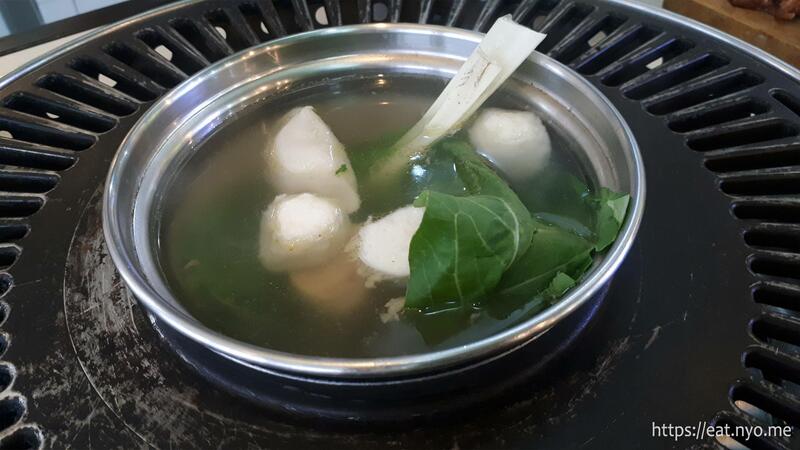 While quite typical and nothing special, the sheer amount of times we’ve been having grills recently made this shabu shabu a pleasant break from the usual. We did have some technical difficulty as our table’s burner was out of gas, but was remedied easily by the attentive servers. It’s a bit of a small cooking area, especially since the hotpot shares the grill. Also, there’s a risk of meat bits falling through the gaps, which happened to us once or twice during the dinner. While we did manage to finish all the meat given to us, we didn’t ask for more. We were quite satisfied with the multiple trips back to their refrigerator for stuff to put in the hotpot and kimchi… especially the crunchy just-the-right-spiciness kimchi. 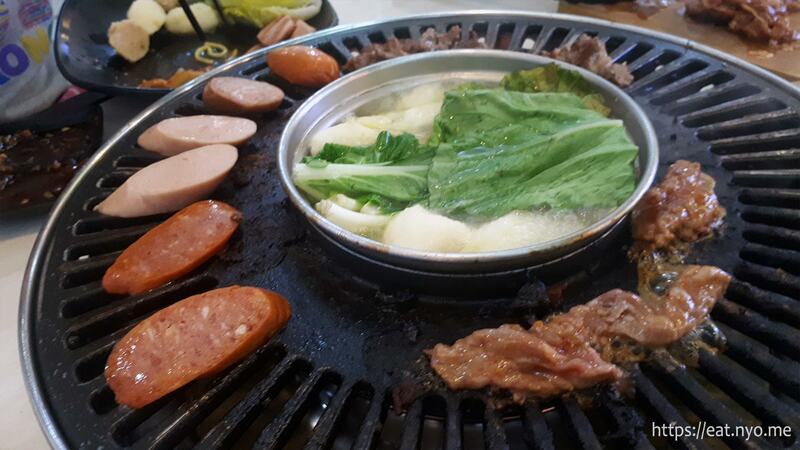 Perhaps it would’ve been a cheaper experience if we’d forgone the sausages and instead focused on their humble hotpot offerings and the grillable meats. Budget-wise, though, The Cooking Room was actually okay. The variety and quality you get is above average compared to the competition. Honestly, if the mishap I mentioned in the third paragraph didn’t happen, and maybe if we forgone the sausages and instead gone full hotpot and grill only, maybe I’d even give this place two thumbs up. But as it stands, being above average doesn’t really cut it anymore, especially with the numerous all-you-can-eat Korean grills in the area. While this place definitely has an edge with its hotpot, sausages, and Mongolian offerings, it didn’t really give me a vibe that I’d like to frequent this place. It’s definitely a nearby option when we’re craving for hotpot, but if it’s a special occasion, we’d rather go to Four Seasons and pay a bit more for a much better experience. However, what The Cooking Room does a bit better is having the various options I mentioned above. While I can’t attest to their Mongolian offering, the other three that we did manage to try were definitely worth it. I’d reckon this is actually a good place for a group who has varying degrees of hungriness and preference; if they’d allow this, that is. I’m actually not sure, but since I don’t see myself and my Betrothed going back anytime soon, I can’t be bothered to make sure. 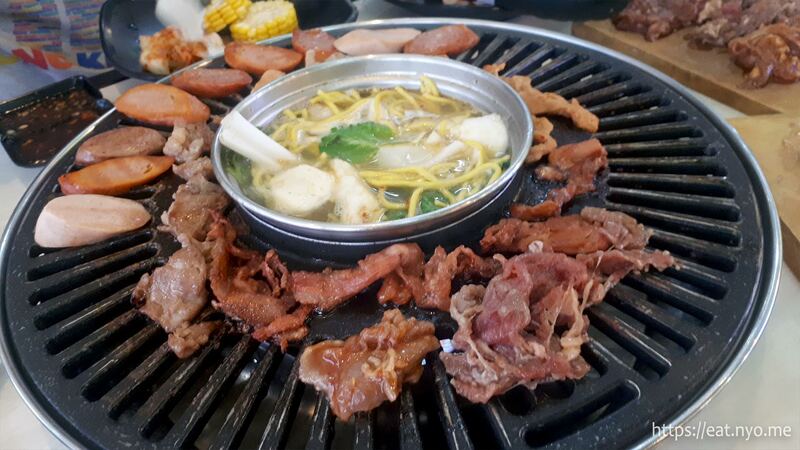 Recommended for: Hotpot and kimchi lovers; carnivores. Smart nomnomnom tip: Reserve if you can beforehand; the place actually does get full, especially on weekends.